January 2006 figures illustrate that Nebraska continues to have far more cattle than people. Cattle outnumber Nebraskans nearly 4 to 1. Cows number 1.93 million, versus Nebraska residents who number just 1.7 million. 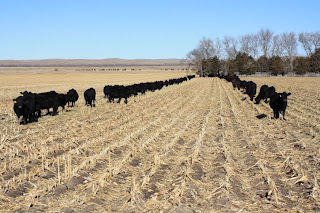 This time of year in the Platte River Valley, cattle will most often be seen on the corn fields, eating up the stalks and waste corn before the geese, Sandhill cranes and other migratory birds move in. And no, cattle don't usually line up in parade formation. These have just been "caked" so they're lining up to eat their fill. And cattle aren't completely dumb, either. 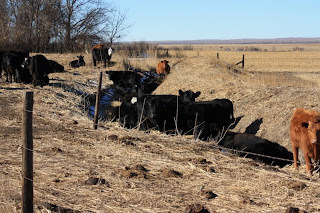 On a cold blustery day, these yearlings were taking shelter from the wind in a dry irrigation ditch. The cows have been dropping their calves for nearly a month now, but it is amazingly hard to get a good picture of a group of black cows and calves. It all turns out to look like just one black blob. So, until I can find some cute red-white-faced mamas and babies, these will have to do. The importance of cattle feeding to Nebraska’s economy runs deeper than in other states. Nearly 5 million head are finished and marketed in Nebraska, a state with a population of 1.7 million residents. Texas markets a third more cattle than Nebraska, but it has a population of 20.1 million residents is nearly 12 times larger. Iowa markets less than 2 million cattle and has 1.1 million more residents than Nebraska. This means such states depend on other industries. Their standard of living isn’t nearly as dependent on cattle feeding as Nebraska’s.